This flag set includes wooden poles with end caps. 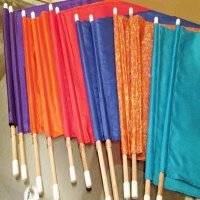 These flags are small enough to worship with in environments with limited space, very light weight as well as a perfect size for children. Easy to store and fits into any suitcase for travel. Flag sets come in a choice of 2 colors. White& Light Blue are SOLD OUT.